Americans know about the Boston Tea Party and the “shot heard ’round the world,” but sixteen months divided these two iconic events, a period that has nearly been lost to history. The Spirit of 74 fills in this gap in our nation’s founding narrative, showing how in these mislaid months, step by step, real people made a revolution. After the Tea Party, Parliament not only shut down a port but also revoked the sacred Massachusetts charter. Completely disenfranchised, citizens rose up as a body and cast off British rule everywhere except in Boston, where British forces were stationed. A “Spirit of 74” initiated the American Revolution, much as the better-known “Spirit of 76” sparked independence. Redcoats marched on Lexington and Concord to take back a lost province, but they encountered Massachusetts militiamen who had trained for months to protect the revolution they had already made. The Spirit of 74 places our founding moment in a rich and new historical context, both changing and deepening its meaning for all Americans. Open Letters Monthly calls The Spirit of 74 a "lively and thoroughly-researched" study of the early days of the American Revolution. 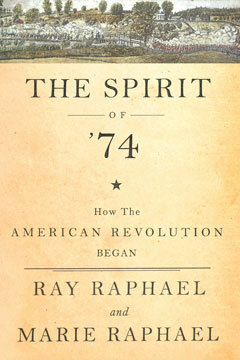 Kirkus calls The Spirit of 74 "a well-conceived work of popular history that fills a gap in the chronology of the American Revolution."